Veronica Selco is a certified professional dog trainer and an advocate for animal wellness. Having earned a B.A. degree in Child and Family Studies at California State University, Los Angeles in 1994 and then a M.S.W. degree in Social Work at Columbia University in 1997, her early training is in human behavior, counseling and community organizing. Her work at Shriners Hospitals for Children Los Angeles, Children’s Hospital Los Angeles and LAC+USC Medical Center involved supporting children, adults and families in coping with illness, trauma, abuse, end of life care and death. Her experience also included individual, family and group counseling, behavior modification, life skills training and end of life planning. This challenging work helped prepare Veronica to work with behavior problems pet parents encounter with their canine companions. Since moving to Las Vegas in 2005, Veronica has pursued her passion for dog training and animal welfare. She has served as independent rescuer, partnering with various rescue organizations to save and enrich the lives of displaced animals. Recently she has co-founded Hearts Alive Village, a non-profit dedicated to keeping domestic animals out of the shelter system by providing access to quality food and needed veterinary care for families in need. 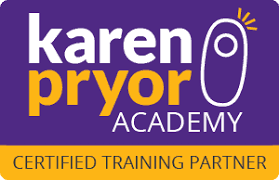 Veronica is a Karen P﻿ryor Academy Training Partner (KPA CTP), Certified Nose Work Instructor (CNWI), Animal Massage & Care Provider (AMCP) for small and large animals and is also certified in Dog Yoga through the University of Las Vegas (UNLV). She is also an AKC Evaluator for Canine Good Citizen®, S.T.A.R. Puppy®, Community Canine®, Urban Canine Good Citizen® and Trick Dog®. She is also proud to serve as a mentor for future dog trainers enrolled in the Victoria Stillwell Dog Training Academy. Veronica has trained in various modalities with pioneers in the fields of animal behavior, veterinary aromatherapy, canine fitness and massage, color therapy for animals, and Tellington Ttouch®. Veronica is committed to making learning positive and fun for dogs and their people. She is an avid and eager learner and regularly participates in continuing education to further expand her knowledge base. In an effort to advance the quality of training and to promote safe, effective and humane handling of animals she regularly hosts workshops and seminars for instructors and pet parents and attends conferences with leaders in the field of science based animal behavior and training. She is also proud to host K9 Nose Work® Odor Recognition Tests and Trials.